A Companion to the Punic Wars offers a comprehensive new survey of the three wars fought between Rome and Carthage between 264 and 146 BC. 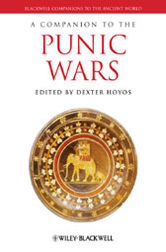 Offers a broad survey of the Punic Wars from a variety of perspectives. Features contributions from an outstanding cast of international scholars with unrivaled expertise. Includes chapters on military and naval techniques, strategies, logistics, and Hannibal as a charismatic general and leader. Gives balanced coverage of both Carthage and Rome.